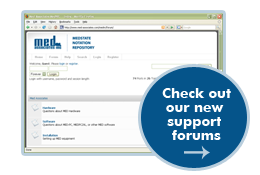 The forum has been updated to add some additional security features. Please update your bookmarks and check back for new content often. The aim of this repository is to offer researchers a place to exchange MEDState Notation code. In the spirit of the open-source movement, all code on these pages is available free of charge to both academia and industry (view license). Being a community-driven project however, we need input. We need the programs you wrote. The advantages of sharing code are many. First, because other researchers have quick access to your procedures, your results are more easily replicated and expanded. Futhermore, it increases the ease with which differences in results between two procedures can be found. If your code is available from this repository your work can more easily be adapted for use in other labs. Second, because you have quick access to the procedures used in other labs, procedures can be deployed in your own lab faster and with fewer bugs. You spend less time writing and debugging code, and more time using the procedures. Finally, because a lot of researchers are using the same procedure, more bugs are spotted and corrected. All code contains 20 to 30 bugs per 1000 lines of code on average. Because so many more people use a shared procedure, the probability of spotting those bugs and correcting them increases. In addition, because code is shared, much less code is written to begin with, since not everyone writes and maintains his own version of the code. Open code therefore contains fewer bugs. For an open repository to work, contributors need to release their code early and often (RERO). It is not necessary to release a 'finished product', as features and updates are continuously added to the code. The features and updates are managed by the maintainer of the code, but submitted by all users of the procedure. In this way, you may eventually use a procedure you submitted, but is now capable of doing much more than you intended it to do at first. So submit the procedures you use today, and please volunteer to be a maintainer for your code. If you have good ideas for this repository, why not contribute and become a team member?